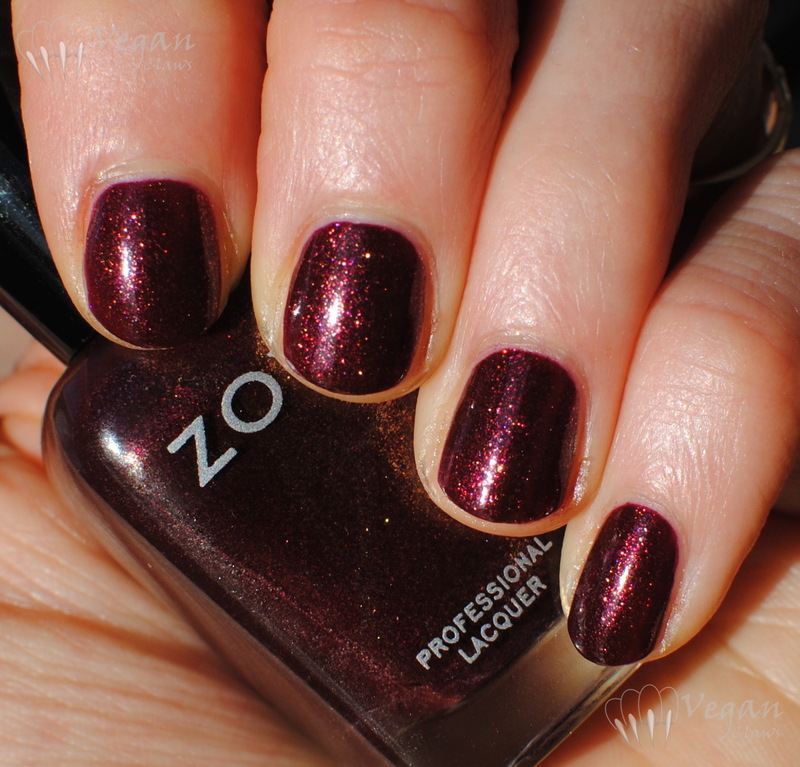 This burgundy-red beauty is India from Zoya’s Ignite collection of last fall. Shown in two coats, no top coat. Great formula. It’s got a ton of glass-fleck shimmer that reflects golden, red and purple tones. 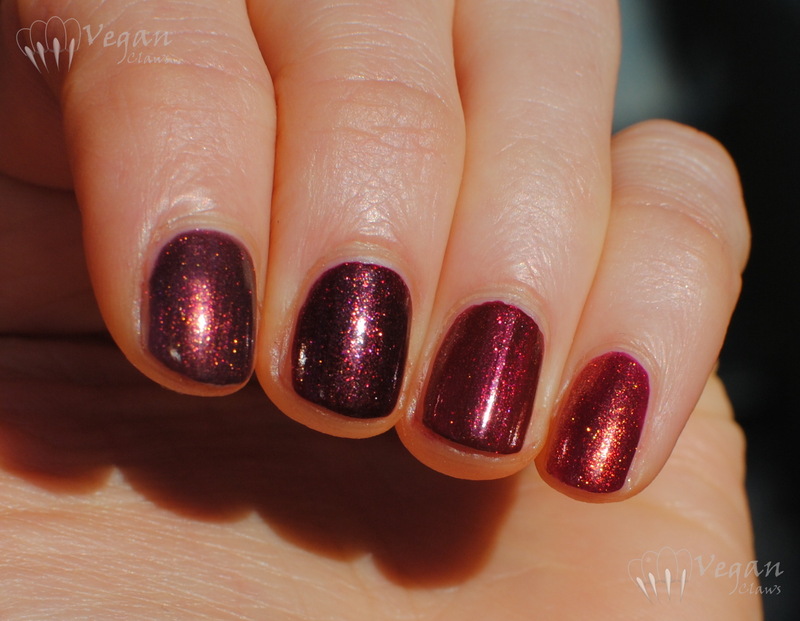 Here’s a comparison between India and Zoya’s Anastasia, Joe Fresh Cinnamon, and FingerPaints Palette of Perfection. Anastasia is shown in four coats; it’s a lot more sheer. 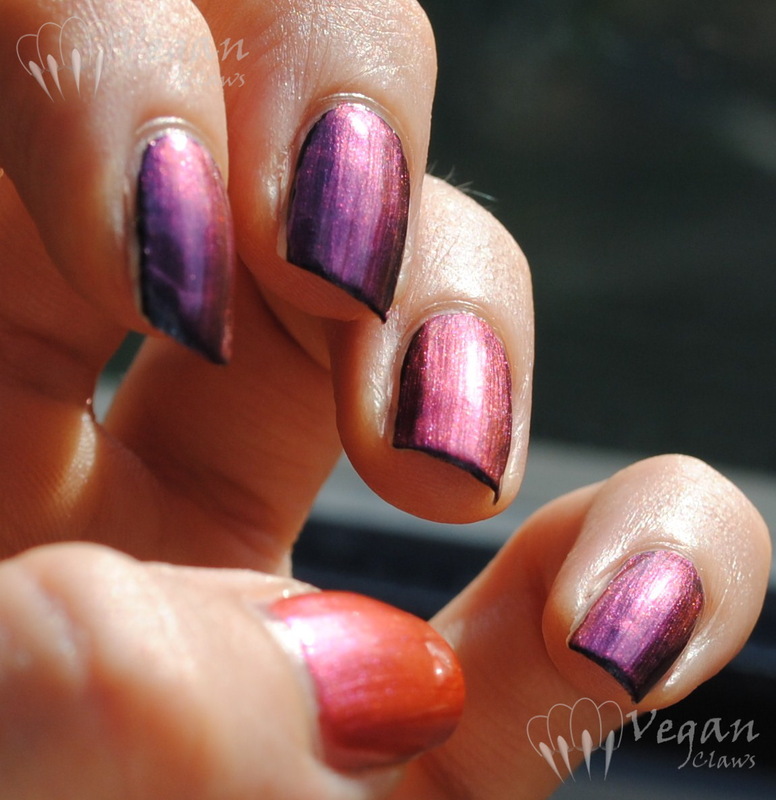 It also has a more plum-leaning base, and the base is metallic instead of jellyish like India’s. 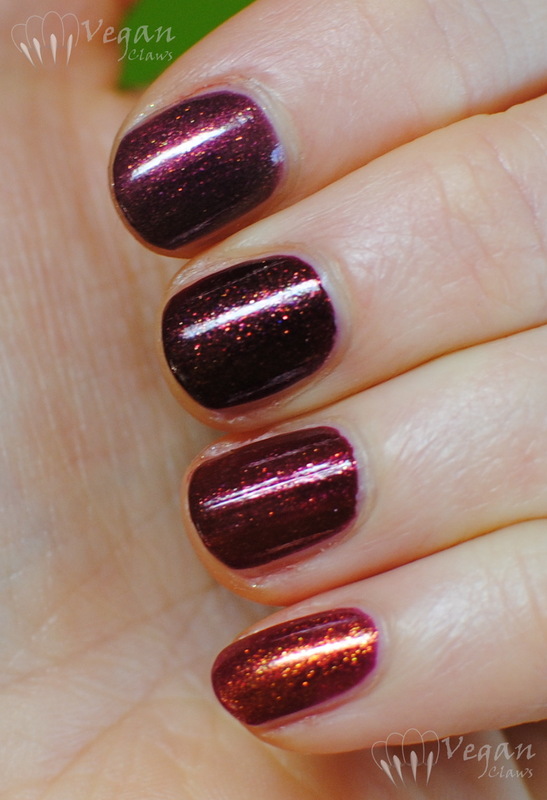 I would say Anastasia is like a plum version of Zoya Autumn with its more metallic base. 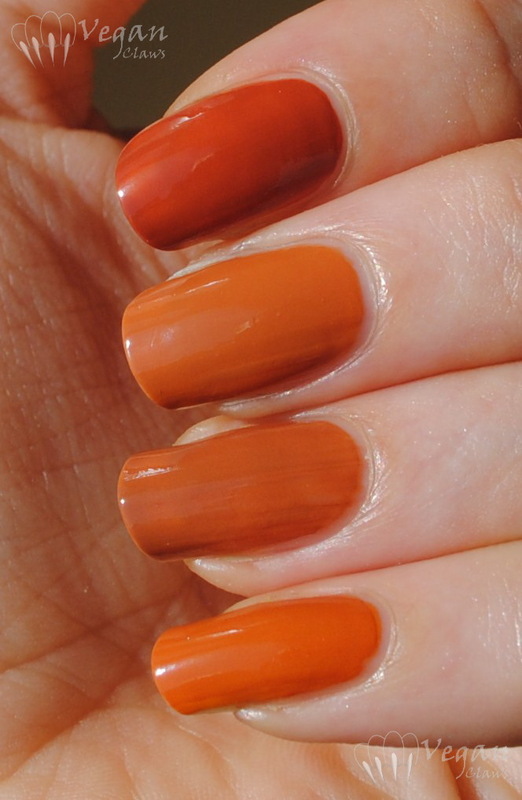 Joe Fresh Cinnamon is shown in two coats like India. It’s got a lighter red base and less intense golden shimmer than India. And finally, FingerPaints Palette of Perfection is also two coats. 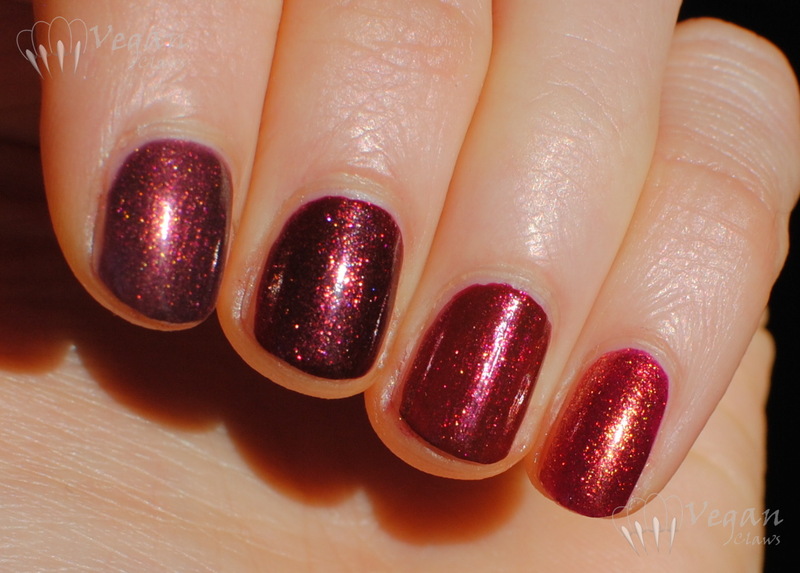 It’s a truer red with no hint of burgundy/purple, and its golden shimmer gives it a very warm/orangey tone. Love this comparison as an ombré mani! A few random manis from various points over the past year or so! Soulstice Spa Crete… I still don’t like silver on me! Here’s another neon from the China Glaze Sunsational collection! Sun of a Peach is a neon pastel peach, and a great unique colour! I like the name too, haha. The formula is a bit difficult to work with, but not really worse than other neons or pastels. I used three coats to even everything out. The photos include base coat and top coat. And here is a nail wheel comparison with other peaches, neon and non-neon, and some that lean more towards coral. 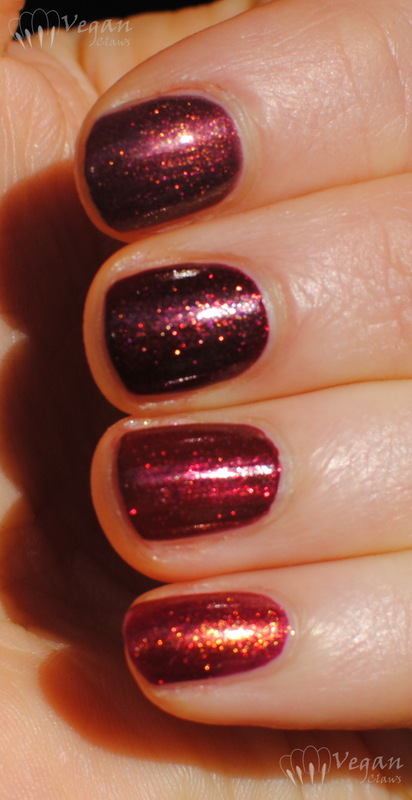 The photo was taken with flash, but somehow the polishes still look a bit darker than they do in real life. So, word of warning that these aren’t colour accurate, but give a good indication of the relative differences in these polishes! None of these are close to Sun of a Peach; the most similar are Kleancolor Mango which is darker and much less bright, and oldie NYX Amazon which is a translucent jelly with iridescent glitter, however. But as you can see there are some dupes and near-dupes among the other polishes – notably China Glaze Peachy Keen and Misa Shake it to the Samba which are basically identical. Cult Nails Scandalous is also similar to OPI Apricotcha Cheating, and Kleancolor Pastel Orange to Illamasqua Purity, but those pairs aren’t close enough to be dupes. I still have some really old photos from when I started blogging, so I thought I would post them in a few installments! 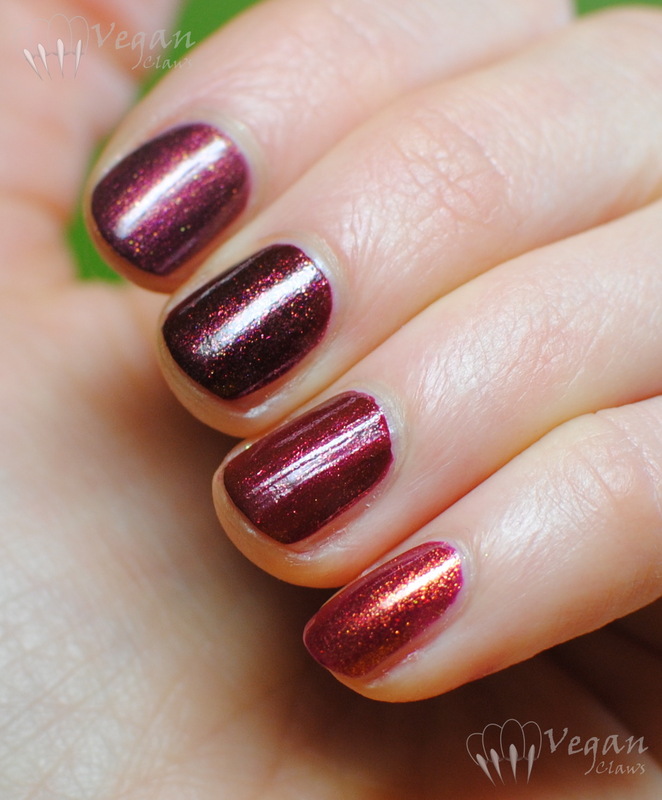 This first one is a fall mani that I really loved! Thumb to pinkie: Finger Paints Sketchy Character, a mustard yellow frankenpolish, Kleancolor Fashionista, China Glaze Brownstone, Joe Fresh Pumpkin. 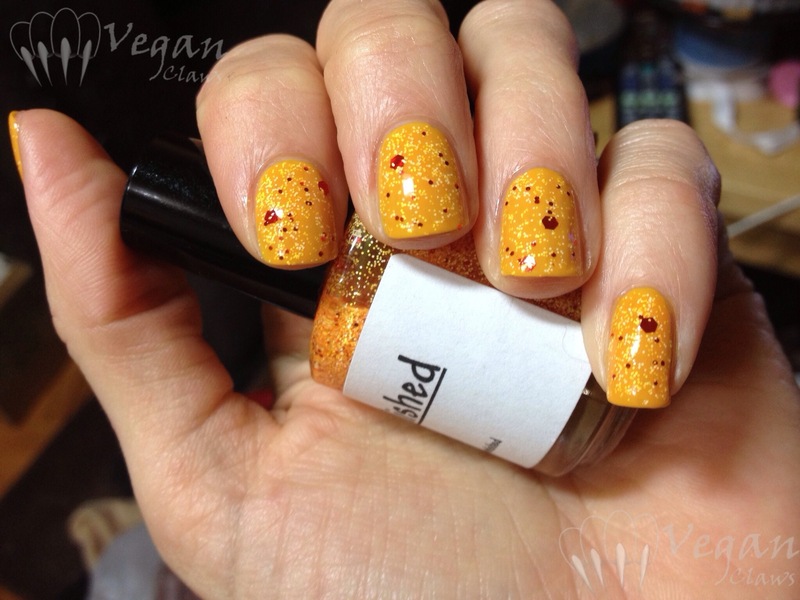 The glitter gradient over everything was done with Nubar Lime Green Glitter and Orange Glitter. I’ll finish up this first vault post with swatches of the creme half of the Color Club Back to Boho collection, along with a couple of layering combos using them. 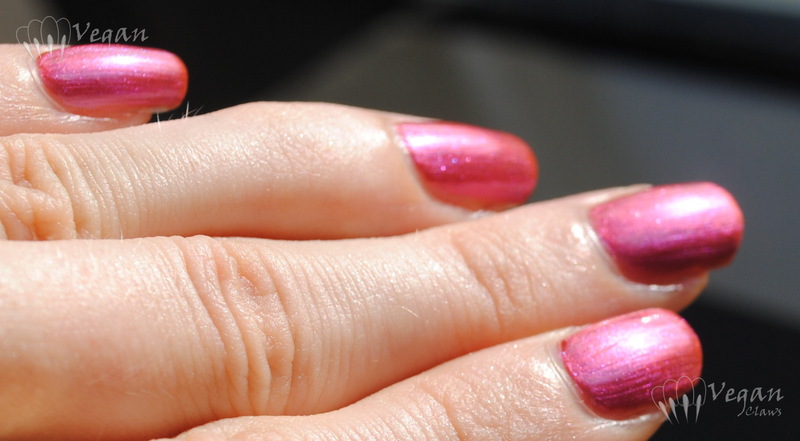 Color Club Red-ical Gypsy – gotta say, the stereotypical gypsy-themed polish names just make me think of cultural appropriation… This is a nice red though, and look! An appearance from my little Thor! This is a very picture heavy post, because this polish is quite the chameleon! Orly Synchro is from the Electronica collection released for early fall 2012. 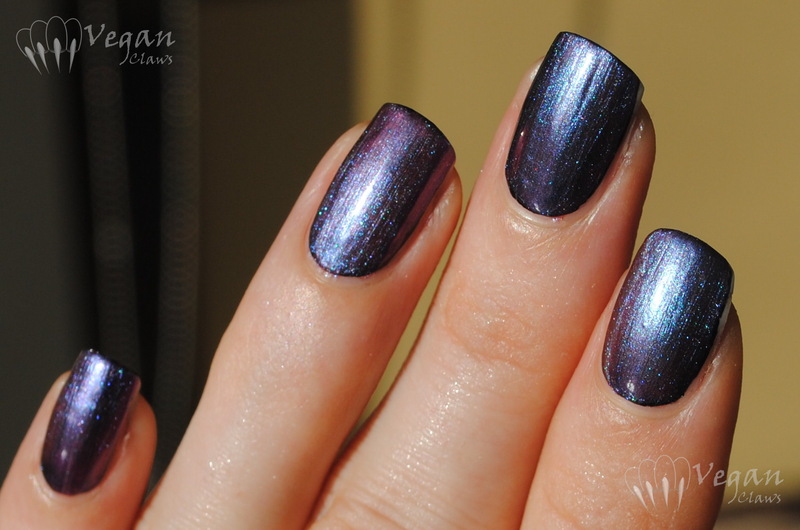 It’s a duochrome shimmer that is kind of frosty. The colour ranges from coral to pink to purple to nearly blue, depending on the angle. The formula was a bit thick and sticky; not the easiest to work with. Care also has to be taken to get the brush strokes straight. 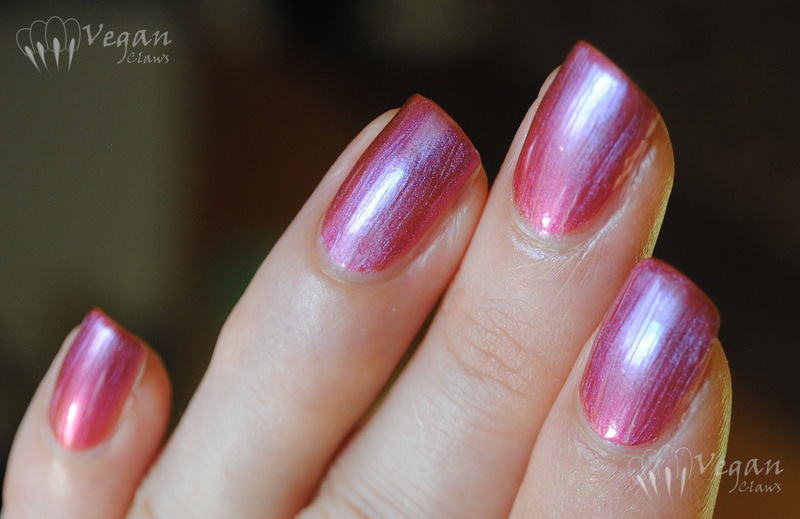 It’s also pretty sheer, and this was three coats, the last one thick. Totally worth it though! The colours are amazing! It makes me think of a sunset. I also swatched it using one fairly thick coat over black (one coat of Kleancolor Black). The layer on my ring finger somehow ended up being thicker than the others, and it shows in the photos; the ring finger has more of a pinkish-purple tone while the other fingers show off the more blue side of the polish. I found the trick to applying Synchro to be using a thick enough final coat that you have time to straighten out the brush strokes before it starts to get sticky. I just love all the colours in this! And how it looks quite different over black versus on its own! 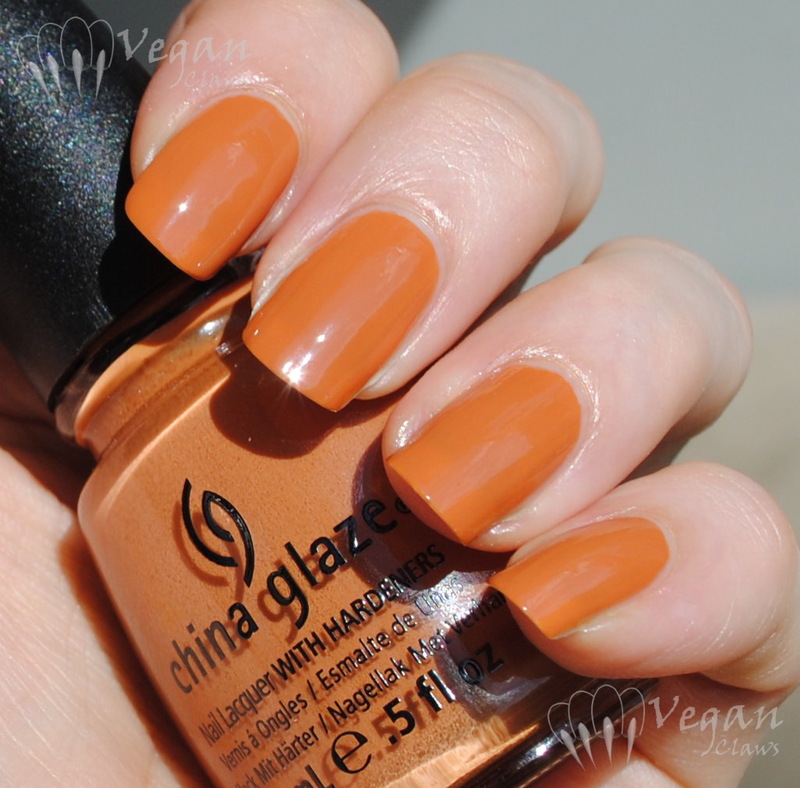 Desert Sun is one of three shades I picked up from China Glaze’s new On Safari collection. I’ve got another post in the works featuring the other two polishes but I’ll start with this one! 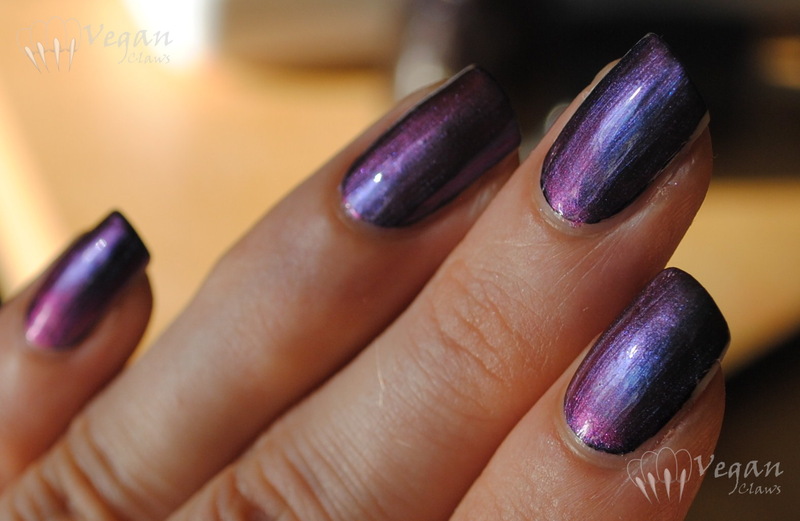 This is one of those “ugly-pretty” shades I love so much. It’s a medium orangey-brown creme. It actually turned out to be a bit more orange than I expected. I compared this shade to some similar ones I have. From index to pinkie, we have OPI Ginger Bells, China Glaze Desert Sun, OPI & Apple Pie, and Joe Fresh Pumpkin. Each swatch is two coats of polish, no top coat. 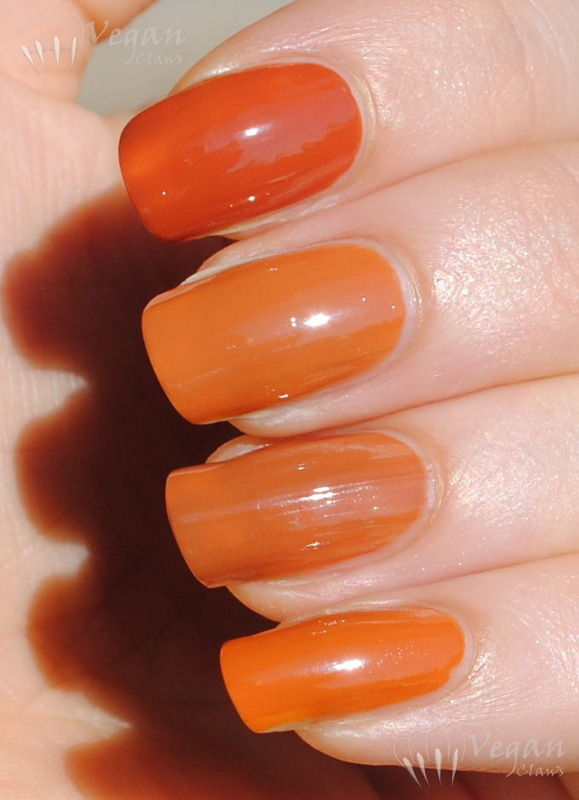 Desert Sun is very similar to OPI & Apple Pie, but Apple Pie is slightly more brown. I found the formula to be better on Desert Sun, as OPI & Apple Pie was thinner & seemed more prone to bald spots. Apple Pie is also an older OPI from before they went “big 3 free” so it has DBP, toluene, etc in it as well as the old skinny brush. As you can see Ginger Bells is darker and has more of a red tone than the others, and Pumpkin is the least brown of these shades. If I had realized that Apple Pie was going to be a bit browner than Desert Sun, I would have switched their places and turned this comparison swatch into an ombre mani!